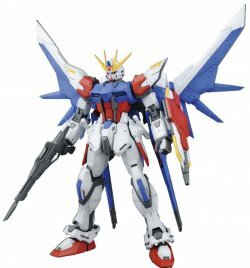 New version of BUILD STRIKE GUNDAM from "GUNDAM BUILD FIGHTERS" has arrived in MG form! Uses the proportions and styling of the MG Strike ver RM as a base. New features found only on the MG include landing gear for Build Booster, attachment points for weapons th.. Build Strike gundam in Gundam Build fighter this kit is one of the best as you can upgrade it to Star Build Strike when you attach the Univers Booster plus the plavsky effect.. Good articulation good details. Thumbs up for this.